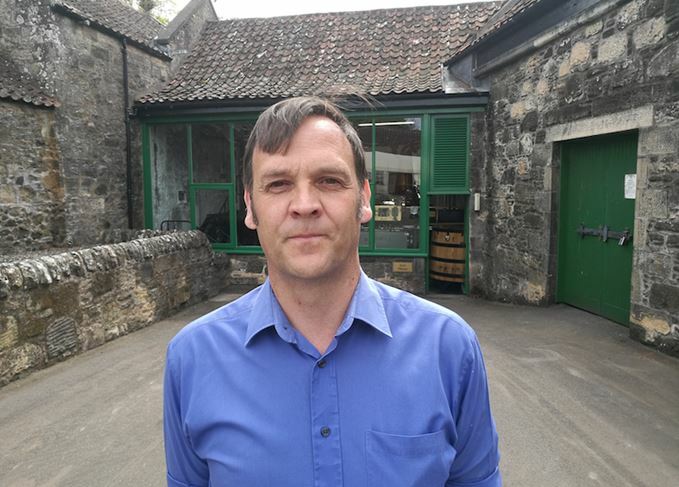 Farmer and distiller Francis Cuthbert is the co-founder of Daftmill distillery in Fife. Spirit first ran from its stills as long ago as 2005, but the inaugural release of its single malt only came earlier this month. Gavin D Smith spoke to him. ‘I’m a farmer who moonlights as a distiller, so if you come to the distillery, don’t expect a professional tour. It’s just me talking about what we’ve done and what we do now. ‘We grow all the barley we use in the distillery and lots more besides. Our biggest customer is Edrington for Highland Park and Macallan. We send the malt we keep for ourselves to Crisp Maltings in Alloa for malting. ‘We send 100 tonnes at a time and get 80 back. They guarantee it’s our malt. We only keep back around 10% of what we grow. ‘In 2005/6, when we started distilling, we used Chariot barley, grown next to the farm and distillery. Since then, we’ve grown Optic, Publican and currently Concerto. Next year, we’ll probably opt for Laureate. ‘We’ve just ordered a new mill and silo, which means we can do away with the wheelie bins we currently use to move the grist and store it. We’re going to pay for it with all the money we make from our inaugural release! ‘We stop and start up distilling a lot. It really is a case of fitting the whisky-making into the farming year, just like they used to do in days gone by. We distil during July and August, and then November to February, though by no means all the time in those months because there are other things on the farm to do. ‘On average, we fill around 100 casks per year, 90% of which are first-fill Bourbon barrels, plus some Sherry hogsheads and butts. ‘We’re looking for a light, fruity, classic Lowland style of whisky, so we get nice clear wort from our mash tun and go for long fermentations. When we distil, we do it slowly and take a narrow cut. We only do one run per day. ‘We spend most money on fuel and casks. Our original idea was to add value to our barley, which used to sell for around £70 per tonne, by making whisky, but the cardboard tubes for the bottles effectively cost more than the barley! ‘When it comes to the distilling there are three of us doing it: I, myself and me. Who taught me? I think it’s just genetic. All Scotsmen have it in them to make whisky. ‘I read quite a bit about the subject, and lots of people gave us advice when we were starting out, and I can’t remember which advice we ignored and which we took now. ‘We did employ consultants and a retired distillery manager, John MacDougall, plus an engineer who had been involved in building Kininvie distillery for William Grant. We also took advice from the late Dr Jim Swan and used Tatlock & Thomson here in Fife for analytical purposes. ‘As a family, we had long been into our whisky, and we talked about making our own. The more we drank, the better the idea sounded. Apart from growing barley, we had redundant farm buildings we could use. ‘It became something of a joke, but finally we decided we should actually go for it. Daftmill and Kilchoman on Islay started producing within a fortnight of each other, but they made more spirit last year than we have in 12 years. ‘We farm 1,000 acres, a mixture of arable and cattle, and my brother Ian and nephew John run our quarry business. Our grandfather came here to farm as a tenant and we got the chance to buy the place in 1984. ‘Another farm we have just down the road used to belong to the Haig family, Fife’s great distilling dynasty. The old house was pulled down in the 1950s, but apparently Colonel Haig had two barrels built into the wall of it, so he always had plenty of whisky for himself and his guests. ‘Everyone asks why we waited so long before we bottled our whisky, and the simple answer is: I didn’t think it was ready. Also, there wasn’t any great pressure on us to do so. We have pretty low overheads and no staffing costs, so we could afford to wait. ‘Then we were approached by Berry Bros to release a bottling, and I like the whiskies Doug [McIvor, the company’s spirits manager] does for them, and was keen on the idea of a new distillery, a new single malt, partnering with a really historic firm with such great heritage. The Lowland distillery will bottle its first malt more than a decade after it was founded.